For a recent project I needed to refactor a primary view within our iPad app, so I decided to learn the ins and outs of UICollectionView (introduced in iOS 6) and I thought it would make for a good tutorial to share. My project ended up needing a custom UICollectionViewLayout which meant I needed to handle more of the layout logic than if I'd used the UICollectionViewFlowLayout that Apple provides. However, creating a custom layout allows far more design flexibility, so thats what I'll be taking you through here. 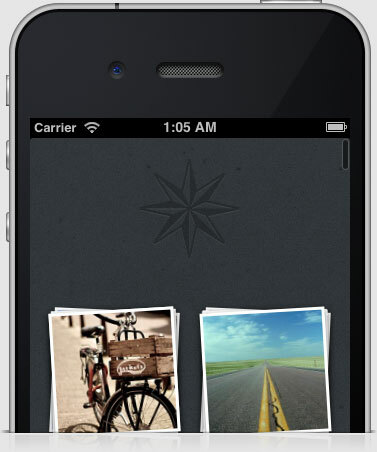 At the end we'll have a fully functioning photo stack layout as seen here. Even if you're interested in implementing a layout which is considerably different than the one presented here, the fundamental concepts will be quite similar. So kick back with your favorite beverage and in an evening or two you'll have a full understanding of custom layouts. The final project is available on github. This tutorial is focused on the iPhone, but if you want to create a project for the iPad, most of what's presented should work with minimal changes. Once your project is created you'll have a bare-bones iOS app with a stock UIViewController. In this design, all of the content for our view controller will fit within the collection view automatically provided. If your design has other elements such as static header or footer sections, then you'd want to use a UIViewController with a UICollectionView as one of it's subviews. You may want to rename the view controller to something more appropriate. This can be done easily by selecting the class name in code and choosing Edit > Refactor > Rename. You should also update the xib referenced when calling initWithNibName: in your app delegate to reflect the name change. We also need to change the xib associated with this view controller so that it references a UICollectionView rather than the stock UIView it has now. Select the view controller's xib, then open the right side inspector pane if it isn't open yet. Find a Collection View object from the bottom of the right pane and drag a new one into the left sub pane under the view which already exists. Now we have a Collection View instance, but our old view is still associated with the controller. Let's fix that. Select the old View in the left sub pane and delete it. Now Control-drag from the File's Owner to the Collection View. 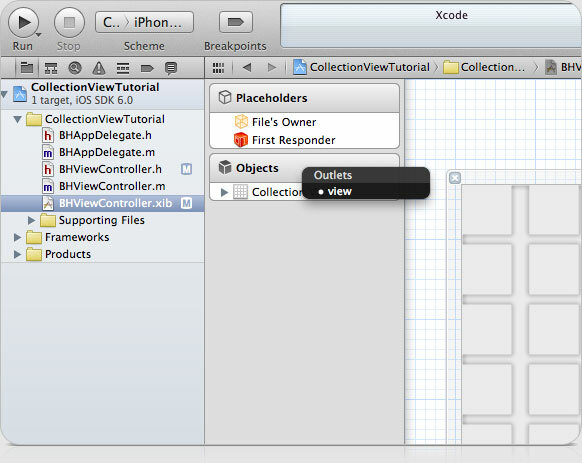 When you release, select view from the list to designate the collection view as the view controller's primary view. Now is a great time to organize our Xcode files a bit, before we keep adding more class files. 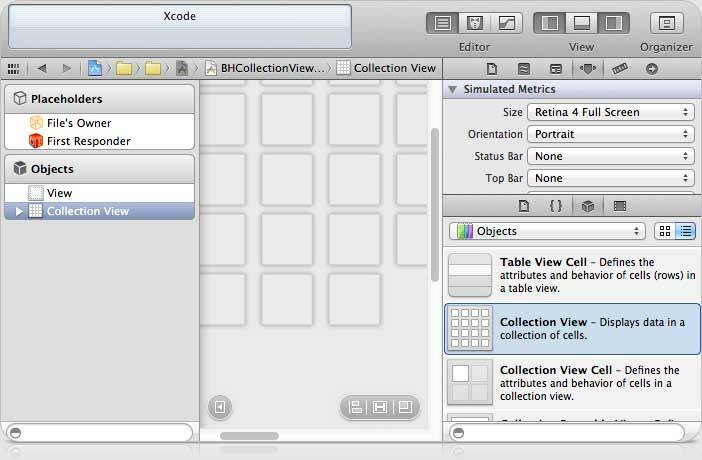 Create a new Xcode group named View Controller and drag the view controller and associated xib into this group. Since we'll be creating our own completely custom layout, we need to create a Collection View layout subclass which will handle the layout logic of all of its subviews. Next, we'll make a couple changes to the view controller's xib to support our custom layout class. Select the view controller's xib again, then select the Collection View instance in the left sub pane. 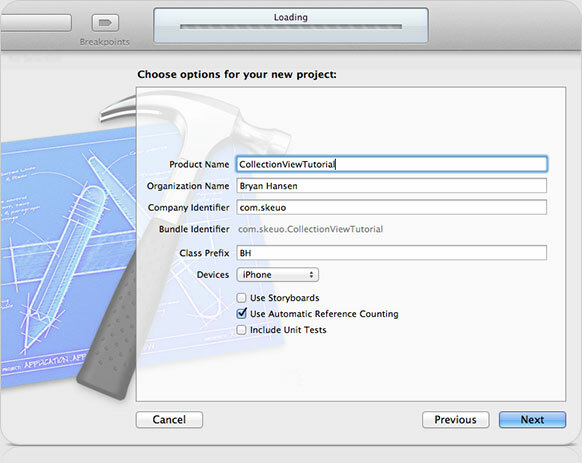 In the right inspector pane, select the Attributes tab and then scroll down to the Collection View section. 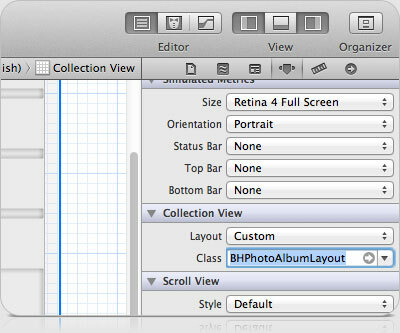 In this section, change the layout from Flow to Custom, then enter BHPhotoAlbumLayout in the revealed class field. Eventually we'll need to access the instance of this layout from our view controller so we should create a property outlet in code and hook it up in the xib. Switch back to the xib file. 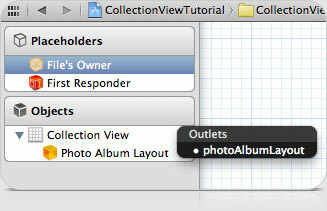 Under Objects, expand the Collection View then control-drag from File's Owner to Photo Album Layout. At this point if you were to run the app, even if you've done everything correct, you'd still be staring at a black abyss… not too reassuring. Setting a background color on the collection view is a good way to check that the view is set up correctly. Now you can fire up your app and ensure that the collection view is showing up as it should. You should see the dark gray background color we defined, rather than the default black. Next we'll start working on the specific views that our collection view will be presenting. UICollectionView and UITableView are actually quite similar in some respects. They both use a delegation design pattern to facilitate browsing and interacting with a collection of views (cells), as well as ensuring performance is acceptable by providing a means to cache and reuse these views. However, whereas UITableView enforces some specifics of its visual design and layout, UICollectionViews do not impose any kind of visual design or layout, allowing much more customization with regard to the presentation of it's content. We'll customize our presentation logic soon enough, but first we'll create some reusable views for our collection view. This is very similar to creating custom cells for a UITableView. Create a new Xcode group named View. Now that we have a simple cell ready for use, we're going to get some basics of the layout logic implemented. We'll start by declaring some properties that will allow customization of various aspects of the layout. Let's set some defaults for these values to make it easier on any consumers of our layout. Since someone could specify the layout of their collection view in a xib file (as we did) or initialize it directly in code, we need to override both the init and initWithCoder: methods. Also, instead of duplicating code, let's create a method named setup which will get called by either of these. Now we're getting to the meat and potatoes of our layout logic. We need to override a handful of methods which will compute and return layout information to the collection view. Although there is more than one way to do this, Apple's recommended approach for layouts which change infrequently and hold hundreds of items (rather than thousands) is to calculate and cache all of the layout information upfront and then access that cache when the collection view requests it. If you'd like to learn more, check out Apple's documentation on Creating Custom Layouts. Define a static NSString for the BHAlbumPhotoCell at the top of the BHPhotoAlbumLayout implementation. Below this, add the top-level dictionary as a private property. We now have everything we need to implement prepareLayout. Let's do this! The logic here is actually pretty straight-forward. First, we create some mutable dictionaries. Then for each section in the collection view we loop through each of it's items and create UICollectionViewLayoutAttributes based on the current index path. We set the frame for this view's attributes and then add these attributes to the sub-dictionary. Once we've looped through all of our sections, we set the sub-dictionary on the top-level dictionary. At the very end, we set our private dictionary property to the temporary dictionary we created here. You may have noticed that we call frameForAlbumPhotoAtIndexPath: which we haven't written yet. I guess we should go do that. The frame is computed based on the index path passed in. First we determine the correct row and column for the item. Then we determine the combined total amount of horizontal spacing between items. Then, if we have more than 1 column, we divide up the total spacing to arrive at the spacing for each item. Now we can calculate the horizontal offset of our frame. Notice that we floor this value so that our frame lands on whole pixels, ensuring it looks sharp. One subtle detail here is that we should floor the value at this point, not in the line before where we divided by the number of columns. This ensures that items are spaced correctly as we go across since we round the valueafter multiplying by the column. Next we calculate our vertical offset and then return the frame based on the origins and item size. Now that our layout has been determined, we need to override the methods which will pass this back to the collection view when its needed. The first one we'll override islayoutAttributesForElementsInRect. This method needs to return all the layout attributes needed for a given content area of the collection view. Since all we're dealing with so far are cells, we simply need to figure out which cells lie within the rect passed in. This is nice and easy now that we have all of our layout attributes at the ready in our layoutInfo dictionary. We start off by creating a mutable array where we can store all the attributes that need to be returned. Next we're going to take advantage of the nice block-based dictionary enumeration to cruise through our layoutInfo dictionary. The outer block iterates through each of the sub-dictionaries we've added (only the cells at the moment), then we iterate through each cell in the sub-dictionary. CGRectIntersectsRect makes it simple to check if the cell we're looking at intersects with the rect that was passed in. If it does, we add it to the array we'll be passing back. The next method we need to implement is even easier because of the caching mechanism we've adopted. All we're doing here is looking up the sub-dictionary for cells and then returning the layout attributes for a cell at the passed in index path. It couldn't be simpler! The last method we need to override to get our layout up and running needs to return the overall content size for all our content. This calculates and returns the total size needed to show everything in our collection view. The height is based on the total number of rows and the width is simply the width of the collection view itself. With the basics of our layout complete, we now need to return some valid content from the data source methods in our view controller subclass. Before returning any cells to our collection view, we first need to designate our view controller as the data source and delegate for our collection view. Open the xib associated with our view controller and control-drag from the Collection View to File's Owner. 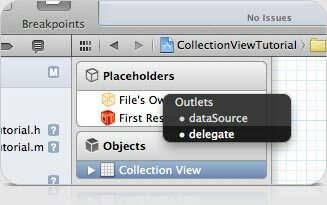 Click thedataSource outlet and then repeat again to set the delegate outlet. In our view controller's header declare that it implements the protocol for UICollectionViewDataSource and UICollectionViewDelegate. Now we're going to register our cell class with the collection view. This tells the collection view what it should be asking for. This necessitates having an identifier for the cell. Next we need to implement three data source methods which will look familiar to those who have worked with UITableView before. For now simply return a static number, we'll get real content working soon enough. Alright, its finally time to fire up the Simulator and see if our layout is working. If you've done things right, you should see a group of gray squares in 2 columns which you can scroll through vertically. Now we're getting somewhere! Alright things are looking great so far, but have you tried rotating your device to landscape? Hmm… not quite what we're looking for. Instead of showing 2 columns and a bunch of unused space on the right, it'd be better to show 3 columns when in landscape. Let's make that happen! CGFloat sideInset = [UIScreen mainScreen].preferredMode.size.width == 1136.0f ? First we check if the device is in Landscape, and if so, we set the number of columns to 3 and then adjust the itemInsets a bit to make things evenly spaced. If we're in Portrait then we set the columns to 2 and use the same values we had set by default in our layout. What gives? Why didn't we get the layout we specified? Moreover, if you try scrolling, things act strangely. The issue is that our layout attributes haven't been updated to reflect the new state of our view. This highlights one of the tasks we must do whenever changes are made that impact the layout of the items in our collection view. We need to invalidate the layout, which will cause all of our layout attributes to be recalculated. This is done by calling invalidateLayout on the UICollectionViewLayout instance and it needs to happen whenever any of the custom properties we added to our layout change. To do this correctly we should explicitly implement the setters for these properties and invalidate the layout there as well. Each setter first checks if the value being set is identical to what it is already set and returns if thats the case. If its different, it sets the instance variable and then invalidates the layout. Run your app now, it should behave as expected when you rotate the device. Model-View-Controller conceptual organization of our app. Since the focus of this tutorial is on Collection Views I'm not going to spend much time on the model classes. Normally you would use something like CoreData or another persistent storage solution to handle this aspect of your app. For this tutorial simplydownload the model classes and then add them to your project. Create a group named Model, then drag files for BHPhoto and BHAlbum into the group. Ensure that the box is checked for your app in Add to targets and if you're dragging the files from a location outside of your project files, make sure Copy item's into destination group's folder is also checked. These classes are pretty straightforward. BHPhoto has a thumbnail URL and image for a photo. 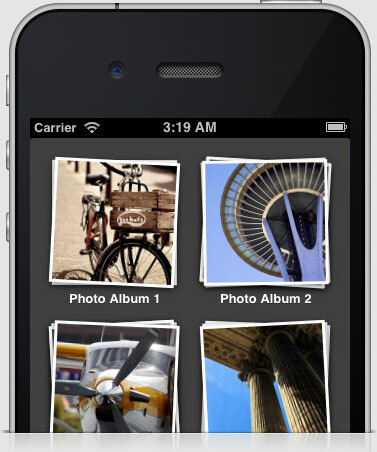 BHAlbum has a name and an array of photos, and the ability to add or remove a photo. Now we can create some albums and add a photo to each so that we have something a bit more interesting to display. At the top of our view controller implementation, import BHAlbum.h and BHPhoto.h. These photos are loaded from the GitHub repository for this project and are some of my favorite photos that I've taken over the past few years. Alright, we've got a few photo albums with a couple photos each ready for us to use. Now we need to update our photo cell so that it can display them. This follows the convention that Apple uses for subviews on UITableViewCell, allowing consumers of this class to change properties of the provided image view, but not switch out the image view itself. 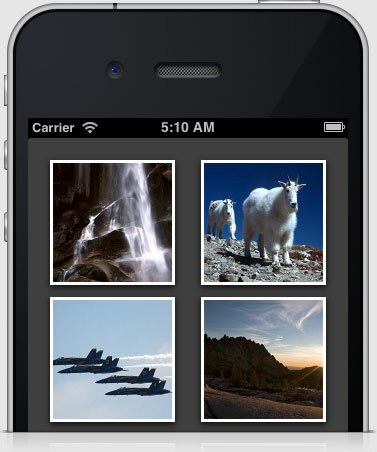 Next we'll set up the image view and some other aesthetics on our cell. In order to pull of some of the desired look, we're going to change some properties on our cell's backing layer. 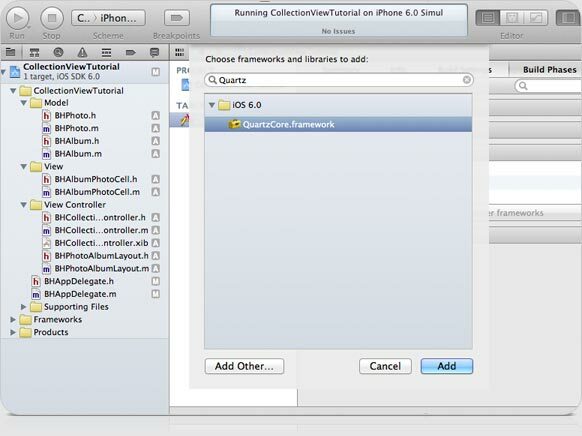 To do this we need to import the QuartzCore framework. Here we're setting a few different properties on our cell's layer to give a nice drop shadow and border affect. We also instantiate our image view, set some properties for its display, and then add it as a subview of the cell's contentView. The last bit of work we need to do on our cell is override prepareForReuse and reset any image that may have been set on the imageView. This ensures that our cells look fresh even when they are reused by the collectionView. We need to call super when overriding this method so that the cell is properly setup before being reused. Sweet, now we can set an image on our photo cell. Here we grab the album for this section and then the photo for this item. Once we have that we can set the photo's image on the cell. Fire up your app and see what you get… After the photos have finished loading, they should be visible in the collection view. Speaking of loading, did you notice how long it took to see those photos? We've essentially ground our apps responsiveness to a halt, as we're now making our users wait for all the visible photos to load before they can see or interact with anything. This ain't gonna cut it. Let's refactor our view controller so that photos are loaded in the background rather than on the main queue. There are a few different approaches we could take here, but I've chosen to use a block-based NSOperationQueue, which let's us set priorities for the operations we perform. First we need to add a private property for the operation queue at the top of our view controller. Now let's initialize the NSOperationQueue and set it on our property. Since our operations are completely independent of each other, we'll also set the max number of concurrent operations it can perform at 3 which will make things load even faster. Add these lines to the bottom of viewDidLoad on our view controller. Next, where we previously were loading the photo image directly each time we loaded a cell, we'll now put the operation queue to use so that it loads in the background. // then set them via the main queue if the cell is still visible. Don't be intimidated by all the concurrency, operations, dispatching and whatnot going on here… well, maybe a little intimidated, but only because it can be tricky for advanced programmers too. All we're doing is creating an NSBlockOperation with a code block that will be executed later on by the NSOperationQueue. Because we're referencing "self" inside the block, we also need to create a weak reference of it to use. This whole setup will allow our UI to remain responsive for our users. With the NSBlockOperation created we'll now add the operation to our queue, which will handle the execution of the block for us. Let's give this a run and see how it performs. The images should be loading noticeably faster now that 3 are loading at the same time and scrolling should be silky smooth. Nice work! Now that we have one photo loading for each album, let's up the ante and get a whole stack of photos loading and looking sharp. In order to do this we're going to take advantage of some other properties on UICollectionViewLayoutAttributes. In addition to setting the frame, we can also set values for transform3D, alpha, zIndex, hidden. If those aren't enough you can create a subclass and add custom properties as well, although I won't be covering that here. To achieve the stacking look we're going for we'll be using transform3D, and zIndex. We want the rotations on each photo to look kind of haphazard and natural, as if someone just dropped them on a table. We'll generate some random rotations to achieve this, but the only catch is that we need these rotations to stay consistent once we're generated them so that we can reload cells without having them change unexpectedly. To do this we'll generate a set number of rotations when we first create our layout and then we'll stick to using them in a predictable fashion through the use of a constant. We're going to load up this array with some CATransform3D rotations, but we need to import the QuartzCore framework into our project first for this to work. First we create a temporary mutable array that we add objects to. Then we run through our loop, creating a rotation each time. We create a random percentage between -1.1% and 1.1% and then use that to create a tweaked CATransform3D. I geeked out a bit and added some logic to ensure that the percentage of rotation we randomly generate is a least 0.6% different than the one generated beforehand. This ensures that photos in a stack don't have the misfortune of all being rotated the same way. Once we have our transform, we add it to the temporary array by wrapping it in an NSValue and then rinse and repeat. After all 32 rotations are added we set our private array property. Now we just need to put it to use. I've opted to set the transform on our UICollectionViewLayoutAttributes similarly to how we set it's frame, through the use of a private helper method. We're making use of the stride constant we declared earlier to jump a few rotation values between sections. This allows us to get our money's worth from the rotations array, by offsetting in from the first rotation in the array based on the section and item of the passed in index path. We then mod this offset by the RotationCount to ensure we stay within the array's bounds. Because we've smartly chosen a stride of 3 and a total rotation count of 32 you'll notice that if we end up having lots of sections, we'll effectively use every rotation in the array as a starting offset, optimally disguising the fact that we use repeated rotation values. Now we just need to set them on our layout attributes. Let's give this a whirl and see what we get. Alright, we've got a variety of rotations being applied to our photos, however you may have noticed that the frame edges look a bit jaggy. This can be fixed by asking our cell's layer to rasterize. Now we should be seeing some smoothly rotated photos in our view. Heck, now that we've got our photos rotating nicely, let's punch up the number in each section to see some sweet, sweet stacking action! After increasing the number of photos, did you notice any difference in the loading time for the images? It's true, we do have more images to load, but we also care more about the top photo in each stack than the ones below it. How about we get that one to load ahead of the others? One of the reasons I chose an NSOperationQueue as my means to load the photos asynchronously is because we can specify a priority level for each operation we create. Using this we can just elevate the priority of loading the top photo in each section. operation.queuePriority = (indexPath.item == 0) ? For the top item we set the priority to high, the others we set to normal. Let's runs the app again and see if this improved our load time. In fact, changing the priorities of our operation tasks is only half the battle. We also need to ensure that what we consider to be the top photo is actually placed at the top of our view. To do that we need to specify the zIndex of our cells correctly. The zIndex dictates whether one cell is above or below another cell. By default all of our cells have a zIndex of 0, which means their order is completely arbitrary. Since we may have a variable amount of cells in each section let's use a base value for our zIndex and then increase it based on how high up in the stack the cell should land, with the top item being highest. Now run your app to confirm that we're back to loading photos swiftly. Alright! we're making progress, only a couple more things to work on before we have a fully designed photo album browser! All these great photos sure are easy on the eyes, but this design also calls for the album name to be shown below each photo stack. To facilitate adding this title to our collection view, we're going to introduce another view type into the mix. Collection views can contain up to three types of reusable view subclasses in their layout: Cells (which we used for our photo stacks), Supplementary views, and Decoration views. If your view requires any kind of data from the view controller to display, then you need to use either Cells or Supplementary views. Decoration views on the other hand are mainly for aesthetic purposes and should not use any data from the view controller. Since our title views will display the name of each album, we need to use Supplementary views for these. Most of the work we'll be doing will be very similar to the setup we did for our cells. Let's start out by modifying our layout to create space for the album titles. To do this we need to add some more vertical space between the bottom of one stack and the start of the one below it. Instead of making the height fixed and inflexible, let's add a property allowing consumers of our layout class to set the height themselves. We're also going to need another unique kind string for the title view we're about to add. Since Supplementary and Decoration views need a kind string for registration lets make this string public so that we can use it for registration as well as in the layout dictionary. Splitting up the definition and setting ensures that consumers use the constant, not the specific value. Next we need to create layout attributes for each title view within prepareLayout. This will require adding another sub-dictionary so that we can store our title's layout attributes in the same way we did for our cells. Now, since we only need one title per section, let's add it at the same time we're adding attributes for the first cell, conveniently using the index path we already have on hand. Notice that we need to supply the kind when creating the layout attributes for Supplementary views. This can be used to differentiate Supplementary views used in your layout that happen to use the same class, but require different layout attributes. (Imagine if we also wanted to have a smaller subtitle below the album name telling users how many photos are in the album. We could use the same view class, but we might want to use a decreased height) For our view we only have one type of supplementary view. Since we're once again calling a private helper method to obtain the frame for our title, we need to go implement that as well. Calculating the frame for our title is a bit simpler since we can just base it off the frame of our cells. We do however need to update our cell frame and total content size calculations to take account for the added height of the titles. The last thing we need to do is override the method which obtains layout attributes for a supplementary view at a specific index path. That's all we need to update on our layout to handle album titles. Because of how we've structured our layoutInfo cache, no changes are necessary for layoutAttributesForElementsInRect: to correctly handle this additional view. If you run the app now, you'll see that extra height has been added between each stack. Next we need to create a class for our album title views. Before we had subclassed UICollectionViewCell, but that class is used only for cells of a collection view. For supplementary views we need to subclass UICollectionReusableView. Create a class within the View grouping called BHAlbumTitleReusableView which subclassesUICollectionReusableView. This title view will be pretty basic, we'll just add one label, giving us a place to set our album name. Now we'll setup our label on the view. Unlike cells where we need to add subviews to thecontentView, here we add them directly on the view. We also need to be sure to reset the label's text whenever the view is reused. Alright we've got some titles, before we can use them we need to define a reuse identifier and register them with the collection view. Next, import the BHAlbumTitleReusableView header at the top of our view controller implementation. Now we'll implement another data source method and return instances of BHAlbumTitleReusableView when the collection view asks for them. Theres nothing special going on here, we get the album for this section and set its name on our title view's label. BOOM! We've got title labels, this thing is really starting to come together. Now that everything is laid out nicely, lets make the view a little more visually interesting by swapping out the dull gray background color for a nice subtle textured look. A great website for finding textures which aren't visually overbearing is subtlepatterns.com. They have dozens of textures in both normal and retina sizes. I found this concrete wall texture to work great. 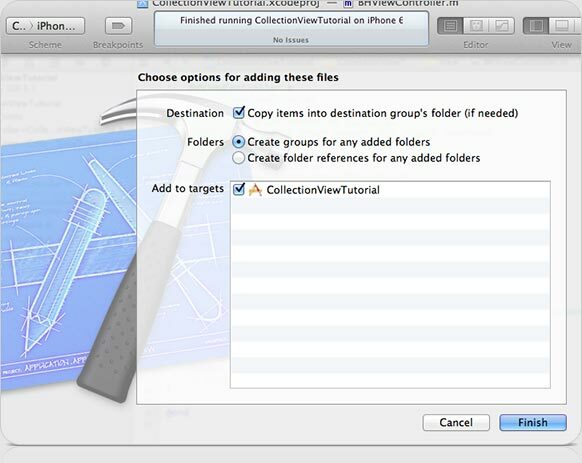 Create a new group named Images within the existing Supporting Files group. 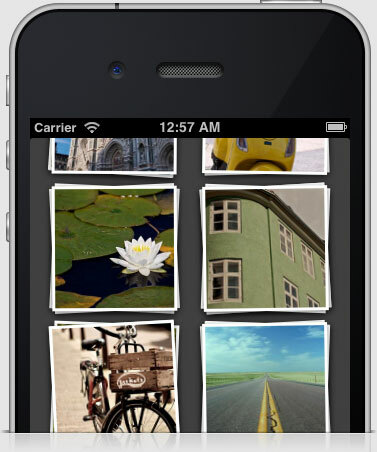 Download a texture you like and then add the image files to the Images group. We can easily add a background texture to our collection view by creating a UIColor with a pattern image. At this point I think we've got a pretty good looking view, but I'd also like to walk through how to add decoration views. Although this may be bit contrived, what we're going to do now is add a small emblem decoration tucked up above the photo stacks. It's something you'll only see when pulling down on the view before it snaps back into place, but it's a good way to show how to work these kinds of views in because they may be more beneficial in other layout designs. Now that we've added cells and supplementary views, this will feel somewhat familiar. The primary difference is that our collection view's data source won't need to be involved with the logic of the emblem view. The layout and the emblem view itself will handle everything on their own. Create a class named BHEmblemView as a subclass of UICollectionReusableView within the View group. For this view, we're just going to display the same image all the time and this can easily be done within initWithFrame: on our emblem view. If you wanted to create a more customizable decoration view, you would need to make use of custom properties, which requires creating a subclass of UICollectionViewLayoutAttributes and then setting those up within the layout. You can use the image I used or use your own. Now we'll set up the view to display our emblem. The collection view will handle instantiation of the emblem view using the frame which we'll set on it's layout attributes. Unlike cells and supplementary views, decoration views are registered with the layout rather than the collection view. 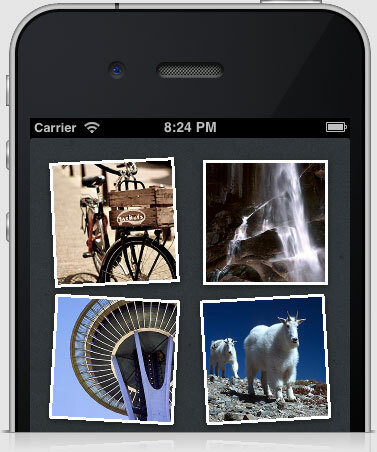 Import the BHEmblemView header into the BHPhotoAlbumLayout implementation. Unlike the other views we've added, only the layout class deals with decoration views, thus we perform the registration here rather than in the view controller. Now lets create another private frame helper method for our emblem. Here we get the default size for our emblem and then calculate an origin that will place the view centered horizontally and ending 30pts above the very top of the collection view and pass it back. Now that we have our frame, we're ready to create some layout attributes for the emblem. Since we're only going to have one emblem, we can create our attributes before we loop through all the sections and rows. Once again, we'll create a sub-dictionary and add it to the layoutInfo dictionary. The last step is to return layout attributes for a decoration view with a given kind at a given index path. That's all we need to do for the emblem. If you fire up the app and pull down on the view, you should see the emblem tucked above. This covers the fundamental steps of creating custom layouts with UICollectionView. I hope it's been enlightening! From this point you could consider implementing custom animations for adding, deleting or moving items. Maybe it would be cool to tap a stack and have it expand out into a more detailed view for that album. If theres a lot of interest I may consider covering more advanced topics in an additional tutorial.